As those of us who've endured 10 months of winter (or so it seems) start to think about spring, some of us automatically think baseball. 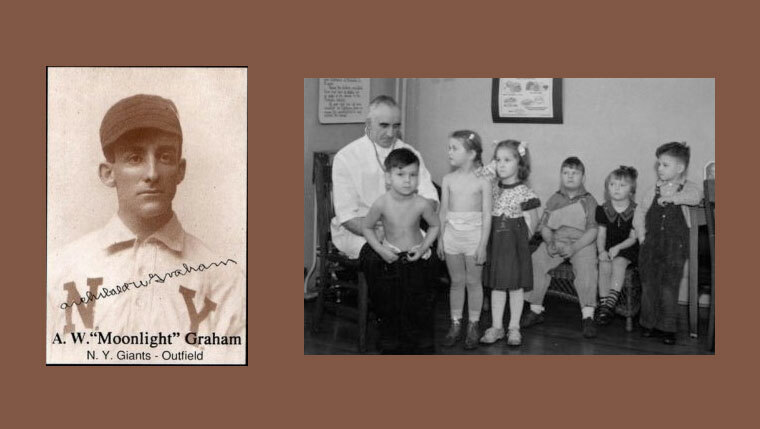 Mayo Clinic, too, is thinking about baseball and producing a new documentary about one of baseball (and Hollywood's) most beloved players-turned-physician: Archibald Wright Graham, perhaps better known as Doc "Moonlight" Graham. If you've seen the movie, "Field of Dreams," or read the book, Shoeless Joe, you know who we're talking about. If you haven't, our friends over at the Mayo Clinic News Network report that Moonlight Graham, after one of the shortest professional playing careers in baseball history, quickly moved on to a post-baseball career as a physician in Chisholm, Minn., where he was famous for "exceptional dedication and service" to both his patients and, as it so happens, to Mayo Clinic. In the movie, Doc Graham, played by Burt Lancaster, famously states, "Son, if I'd only got to be a doctor for five minutes, now that would have been a tragedy. The good doctor's "professionalism and ethics in support of Mayo Clinic values" is the subject of the Mayo documentary. The Hibbing Daily Tribune reports that the new film will be released in July to coincide with the 25th anniversary of "Field of Dreams." The newspaper also reports that the movie "has sparked a world-wide curiosity for more information on the man behind the character." Bits and pieces first started to come out after the release of the 2013 Mayo Clinic Heritage film, "A Cheerful Heart: The Dave Madden Story," which tells the story of a polio patient who spent 16 years at Saint Marys Hospital. One of his regular visitors, it turns out, was his uncle, Dr. Archibald Wright "Moonlight" Graham. But as the Daily Tribune goes on to report, his ties to Mayo Clinic go well beyond that. In fact, the paper reports that Dr. Graham "made many trips to Rochester to observe surgery and attend continuing education courses." An official record of those trips is "documented in the Mayo Historical Unit, where attendance rosters show his signature: A.W. Graham, M.D., Chisholm, Minn."
Dr. Graham also co-wrote medical articles with physicians he came to know and work with at Mayo, including an article on blood pressure in children that was published in the American Journal of Diseases of Children. The Tribune writes that Paul Mueller, M.D., chair of Mayo's Division of General Internal Medicine in Rochester, still "has copies of newspaper articles and photographs about this milestone work." The Rochester Post-Bulletin also reports that Dr. Graham married Rochester native Alecia Madden on Sept. 29, 1915, and both are buried at Calvary Cemetery in Rochester, where caretakers say their gravesites have "attracted people from all over the world. " You can attract some attention of your own by sharing this story, and others, on the In the Loop blog.